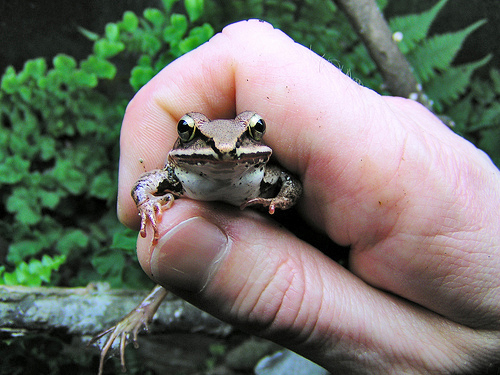 U. PITTSBURGH (US) — Two recent studies show that wood frogs living close to fields are resistant to multiple insecticides, but not to Roundup, a common weed killer. In a new study published in Evolutionary Applications, researchers demonstrate, for the first time, that tadpoles from populations close to farm fields are more resistant to chlorpyrifos—one of the most commonly applied insecticides in the world, often sold as Dursban or Lorsban. “While we’ve made a lot of progress in understanding the ecological consequences to animals that are unintentionally exposed to insecticides, the evolutionary consequences are poorly understood,” says principal investigator Rick Relyea, University of Pittsburgh professor of biological sciences and director of the University’s Pymatuning Laboratory of Ecology. The researchers used newly hatched tadpoles collected from nine populations of wood frogs living at different distances from agricultural fields. They tested the frogs’ resistance when exposed to chlorpyrifos, which is used against insects, and Roundup Original MAX, which is a common herbicide used against weeds. 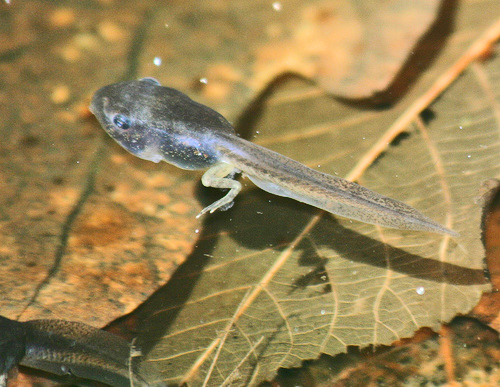 Relyea and his collaborators exposed the tadpoles from each of the nine populations to environments containing no pesticides, chlorpyrifos, or Roundup. After 48 hours, they measured how well the populations survived. “Wood frogs living close to agricultural land were more likely to have been exposed to pesticides for many generations compared to those living far from agriculture; the latter frog populations likely experienced little or no exposure to pesticides,” says Rickey Cothran, the lead author of the study and a postdoctoral researcher in Relyea’s lab. In a related study, published in Environmental Toxicology and Chemistry, the research team examined whether wood frog populations that were resistant to chlorpyrifos might also be resistant to other insecticides. This phenomenon, says Relyea, happens commonly in pest species when farmers switch pesticides from year to year, but little is known about how this switching of pesticides affects amphibians. Using three commonly applied pesticides that have similar chemical properties— chlorpyrifos, carbaryl, and malathion—the researchers exposed 15 populations of wood frog tadpoles to high concentrations of each insecticide. They found that wood frog populations with resistance to one insecticide also had resistance to the other insecticides. As they hypothesized in the new study, the researchers suspect that the reason for this cross-resistance is that chlorpyrifos kills in a way that is similar to many other insecticides. Thus, evolving higher resistance to one insecticide may provide higher resistance to others. “This finding may buffer an amphibian population from suffering the consequences of exposures to new, but similar-acting chemicals,” says Aaron Stoler, a coauthor of the second paper and a graduate student in Relyea’s lab. In the future, the team plan to study the genetic mechanisms that underlie increased resistance in amphibians and determine whether increased resistance occurs in additional animal species that are not the targets of pesticides. A National Science Foundation grant funded both studies. The University of Pittsburgh’s G. Murray McKinley Research Fund also helped fund the second study.